This cherry tree is named "Hikan Sakura," but usually called "Kanhi Zakura," in order to avoid the confusion with the other kind "Higan Sakura." The trees originate in South China and Taiwan, and were brought to Okinawa Islands and Kagoshima long ago. They grow wild in Ishigaki Island and Kume Island. The trees make dark red flowers from January to March, and they just look like gorgeous red plum flowers or pink peach flowers. 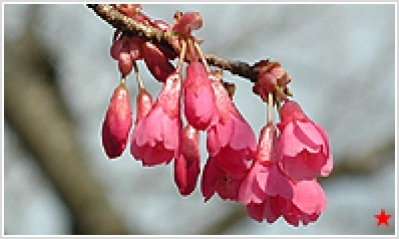 Nowadays they are planted in warm areas from Okinawa to the Izu Peninsula.